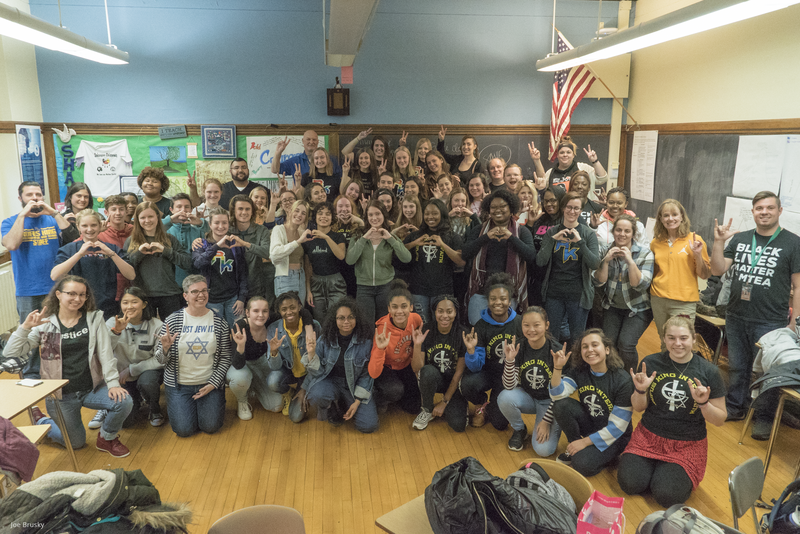 If a photo of students doing a Nazi salute can spread around the country, maybe a photo of students showing the American sign language symbol for “I love you,” could have just as much influence. At least that was the hope of students at Rufus King International High School. After the bell rang on Friday afternoon, rather than heading out to the rows of school buses lined up out front, a group of more than 60 students piled into room 308 at Rufus King, 1801 W. Olive St., to make a statement. They gathered to create a response to a photo that garnered nationwide negative attention online about high school students in Wisconsin. The photo showed about 50 high school boys standing in front of the Sauk County Courthouse in Baraboo, with half of them appearing to salute Hitler. Before they began discussing what they wanted to express in the photo, students from the Jew Crew and the Friends of Islam groups opened the meeting with a blessing. They then decided that they wanted to use the hashtag #WIUnitedInLove to represent the image. The photo depicts students of various races, ethnicities, religions and genders showing hand signals for peace and love. Students are wearing shirts that say, “Black Lives Matter,” “Rufus King Interfaith,” and a rainbow rendition of the school’s logo, representing the gay-straight alliance. Joe Brusky took the photo and a video of the gathering and shared it on the Milwaukee Teachers’ Education Association Facebook page on Friday, which now has more than 18,000 views. Estella Ramirez, 17, said she was inspired to show up after a conversation in her English class. When she walked into class last Monday, the photo from Baraboo was on the board. “We’re trying to recognize that these things need to be talked about in order to change them, and we need to recognize these things and these issues that we have, because if we ignore them, then we’re not going to make a difference,” she said. Her English teacher, Kelly O’Keefe-Boettcher, invited the class to meet after school on Friday to create a Rufus King response. In the video, O’Keefe-Boettcher promises to protect her students’ physical safety as well as their spirits and their minds in the face of hateful acts. Hannah Olenchek, 17, got up in front of her chemistry class to invite her peers to join her in attending Friday’s meeting. She said that she was frustrated that incidents such as the photo can be dismissed as a joke, and she said she felt that people needed to realize the harm that it caused. Jaycelan Stewart, 14, said that so far in her freshman year at Rufus King, she has learned to use her voice. “At this school there are kids with two pairs of shoes and kids with 20, but what brings us together is standing up for what we know is right, and even if it’s a small group of people, it does matter,” she said. 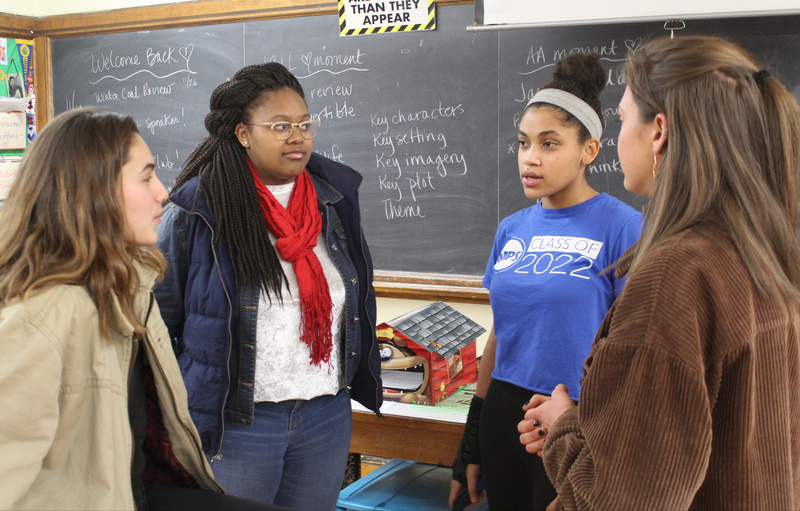 Rufus King’s diversity is another reason why O’Keefe-Boettcher said she felt that the school had a responsibility to show another version of Wisconsin. According to the Public School Review, Rufus King has one of the most racially diverse student bodies in the state. O’Keefe-Boettcher added that she hopes the photo fosters “dialogue and discussion.” Students said that the video was already sparking conversations in their classrooms and in the hallways at school Monday. Ramirez said she hopes students around the country have safe spaces in school to learn about and talk about current events and issues. O’Keefe-Boettcher sees her duty as a teacher to create spaces for students to talk about painful events happening in the world, to be able to process them and to have a platform to take action. I believe that Rufus King High School. I’m thank you for showing the Love to the students off baraboo high . How God would Love what you’ve done. Praise God Thank You. Milwaukee citizen. It would have been nice to see the photo of the students doing the sign language sign. K Weik, in the first group photo they are all making a symbol of love with their hands. Some are make a heart. Some are making other sign language symbols with their hands. Too bad this group jumped to the conclusion that the photo in Baraboo was a nazi salute but instead was a bunch of students waving to their parents, just like the photographer does with a lot of his group photos! Still love the message of love !